She doesn't know what it is. I don't know what it is. She asked if I would put photos here in the hope someone (you?) might identify it. "No", I said, - "It's neither 'loose' nor is it 'leafy'". "It's only loosely a plant," she suggested, hopefully. I looked at it - and agreed. So, here it is. "You realise," she added. "You run the risk of being hounded out of Blotanical?" I nodded. "Everyone will laugh at us." "They'll laugh because they'll know what it is and we don't." "And they'll get angry because they'll all say it's beautiful, even though we don't like it." "I think it'll be alright in the end," she said. "They know a bargain when they see one, those Blotanical sorts. That pot is worth £3:00 on its own - and it came with a 'plant' already in it." Esther suggested I should take the plant for a walk by so we could get to know each other. I demurred but she chivvied us out of doors so I took it to the sea. And now for the plant. And here is its bottom. See the cassette case by which to measure it? Anyone prepared to sing for its virtues? P.S. This post will only make sense if read in conjuction with Esther Montgomery's Christmas Post (Part One). Apologies to usual readers for this interpolation. We'll be back to fungi soon. P.S. Esther's just been round with the anwer. It's Chamaecyparis thyoides 'Top Point'. Well, it's cute as houseplants go, but I agree it's not so much of a Christmas tree! 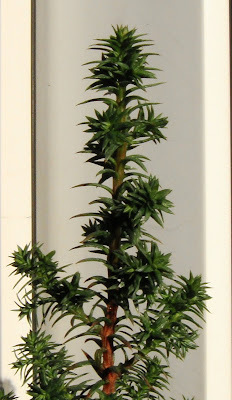 it looks like a very small dwarf Alberta spruce to me, but it's not likely they'd sell those in the UK. There, now people can laugh at the THREE of us! Following your suggestion I looked at Dwarf Alberta Spruce on the internet - but they seem to have needles and this 'tree' only looks as if it's got needles from a distance. When close, you see they aren't. However, having looked at the spruce pictures from nurseries on the internet . . . I've landed up thinking I've done quite well when I compare my pictures with theirs. Desiduous leaves are so much easier! I wonder if it is some kind of Yew; some people call them Taxus. It is a cute little puzzler. Definitely worth the price paid. Did it enjoy its trip to the sea? What a lucky little plant to be adopted by a family who will broaden its experiences and horizons. Surely a pet like it should have a name!? I agree, it should have a name. ;-) Or should you wait to find out what it is before naming it? Not a clue. Taxus is a good suggestion. I've been looking at the possibilities there (including the California Nutmeg). Trouble is I have no idea if it is a fully grown little thing or a very-baby-big-thing. Nor do I know how much it has been shaped by how it has been kept until now. I suspect the supermarket which sold it doesn't expect it to last long so who cares what it is? We'll try our best both to keep it alive and to find out what it is - and hope it flowers some time. That might move us forward. Not sure how many years it will take! 'Orestes' sprung first to mind so I looked him up. He turns out to have murdered his mother and to have spent a lot of his life being haunted by dark shapes. Once I knew that, it didn't seem such a good idea - but Worthing likes the sound of it so . . . 'Orestes' I think it may be. He certainly looks more like an 'Orestes' than a 'Fred'. Lucy - if the leaves are not actually conifer needles, but just look like needles ... Are the leaves fleshy, is it a Crassula? If you can hang on till its first birthday it should flower. Then all will be revealed! It’s fascinating trying to work out what a plant is. I would tend to agree with Elephant’s Eye except that the ‘trunk’ looks rather woody for a crassula. I’d err towards an erica - heather family. I think the photos look very good. I’m waiting to see how long my poinsettias last this year. Is it just me that is hopeless at keeping them alive ? It seems the minute I unwrap them (making sure that they haven’t suffered any major change of temperature / aren’t sitting in a drafty spot) they start losing leaves. I bought a red one and was given two small pink ones. The French call them ‘Etoile de Noël’ - Christmas Star. It has a certain charm, even if it isn't very Christmassy! The memory of it (if not The Plant itself) is going to form part of your family's Christmasses in years to come, I'm sure. Thanks for posting the picture! It's obviously a very musical plant as it appears to be carrying some sort of CD around with it wherever it travels. It also appears to be accessorising quite heavily with that glitzy pot, so I'm guessing it's female. Probably from overseas too as it seems to be gazing longingly across the sea. I don't know what it is, but I like it. Even if you only had it on a sideboard, with an ornament or three, it would make a handy little Christmas tree for one who was space challenged. Definitely a keeper, I think. I think it is a 'keep it and see if it flowers or seeds' kind of plant. It is obviously in plain clothes and undercover so you will wait until it makes a mistake and drops a clue! I have no idea what that "plant" is you have here. I think Esther may have confused things when she said her 'tree' is ten centimetres tall. It isn't, it's ten INCHES tall - quite a difference . . . which might alter your mind on the Crassula suggestion? I don't know. Incidentally, I turned on the radio yesterday morning in the middle of a discussion about somewhere where they are having problems with some kind of crassula which has piled up on itself until it has formed a mat a metre thick! Hello Bare Faced Gardener. Etoile de Noelle seems an excellent name for a Poinsettia. I wish I could use that name in England without seeming pretentious. 'Adam lay abounden' may be alright once or twice in December but if this little tree thinks I'll enjoy it right through till midsummer - I'll confiscate its little cassette case and send it off to live with the big trees. Frances - that's so good of you to do an investigation, Sherlock Holmes style! I've seen the same plants since, sold in another shop. 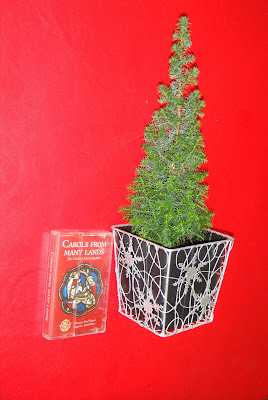 They came with little gold bells and ribbons attached - even a sprig of fake 'proper' Christmas tree plummage! Easy Gardener. That is the conclusion I have come to too - that I'll have to wait until it 'does something'. As long as it drops a clue and not its leaves. Here's the answer - it's Chamaecyparis thyoides 'Top Point'.